Tout récemment rénové et très amélioré avec de beaux comptoirs en granit dans la cuisine et les salles de bain, des carreaux de faïence, du carrelage sur mesure dans les douches, une télévision à écran plat dans le salon et la chambre principale. Le salon est en bas avec 1/2 salle de bain tandis qu'à l'étage les chambres ont chacune leur propre salle de bain complète. Inclus est une cuisine bien fournie, draps mis à jour (y compris les serviettes de plage) (bains sont fournis avec un sèche-cheveux). Il y a des bar-b-q communs juste en bas de nos étapes. Espace extérieur couvert pour l'ombre. Rien d'autre comme ça à Maui. Réveillez-vous à une vue sur l'océan avant même de lever la tête hors de l'oreiller. Vues des îles Molokai et Lanai depuis le salon et la chambre principale. Regarder les tortues toute l'année et les baleines sautent en hiver à droite du salon et des balcons. Le condo est très privé car c'est une unité de fin avec les voisins seulement d'un côté. Cet endroit le plus incroyable de rester à Maui était notre deuxième maison personnelle et nous avons juste remis en location. Tout le monde qui reste ici dit "Wow" Quand ils franchissent la porte. Il n'y a vraiment pas d'endroit comme celui-ci sur l'eau! Quel gemme! 2. 5 Chaque chambre dispose d'une salle de bains et il ya une salle de bain de poudre sur le salon. We very much enjoyed our second stay at this beautiful location. Prior reviews are really accurate. I can't add much except there were a few small but important things that we appreciated. When you close the doors you can still hear the surf. But the sound level was perfect for sleeping. The A/C worked very well. We were always comfortable and didn't have to adjust once. The lanai has plenty of room for guests. The kitchen knives were sharp! We like to cook so that was a welcomed bonus. We'll definitely stay here again. Fabulous condo and great vacation! 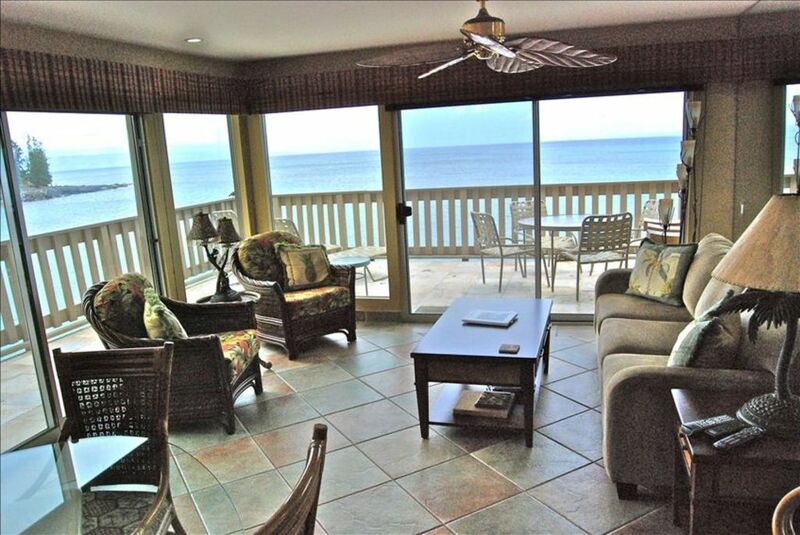 This corner unit has views of the ocean from all rooms, even the back bedroom. Giant sea turtles swim beneath your balcony which overhangs the ocean. Perfect vacation. Highly recommend! It was beautiful and above expectations! Lynn was wonderful to work with! This Unit was so awesome cause it was "front and center" for accessibility, views, and 'at home touch'! We would definitely stay there again! The best condo in the complex! You are at the corner overlooking the sea turtles swimming every morning and you have beautiful views of Molokai and Lanai and are a few steps away from snorkling in the water. The unit is well stocked so you have everything you need to cook your own meals. Lynn is very accommodating and quick to respond to your inquires. This is a true paradise. Phenomenal property- We will be back! This Kahana Sunset condo is the perfect place to be if you love beautiful views at any time of day, easy access to a private beach and an immaculately kept outdoor area lush with flowers and palm trees. Our week long stay at this end unit condo was much more than we anticipated; the kitchen was well stocked, beach towels were provided as well as beach floats and all other items we needed to make our visit carefree. The condo’s location was convenient to shopping, dining and other beaches. The owner left a detailed list of restaurants, places to see, convenient places to shop and suggestions of things to do that really helped us save time when we ventured out. The owner made herself available when we had questions yet not in a bothersome way. We will definitely return to this Maui paradise and can't wait to come back! This was our first trip to Hawaii and we had an amazing experience. The location was fantastic in order to see a lot of different parts of the island. We loved waking up every morning and looking at the sea turtles below the deck and then swimming with them later in the afternoon! The condo had everything we needed. If we ever make it back we know we’re all be staying . Sur une magnifique baie de sable. Idéale pour la baignade, la plongée en apnée, Stand Up Paddling, kayak, trous dans le sable creuser, faire des châteaux de sable, etc. Rentals are Saturday to Saturday and only book out one year in advance. Some exception are made for longer term rentals. We accept Credit Cards and Checks through owner 7142353177. Owner managed for the last 15 years = Better service and quality. Please contact me if I can answer any questions. Maximum Occupants-4 adults + child (Not suitable for 5 adults) **No Sofa Bed!! Strictly NON-SMOKING" CONDO AND PROPERTY Please see rental agreement prior to payment.